Peter Stone hasn't been a vampire very long, but long enough to recognize when the evening is going terribly wrong. What starts out as helping a new vampire with the transition turns into a complex night of lavish parties and unforeseen deceit wrought with conspiracies. Plus what would a vampire story be without bloodthirsty vampire hunters! Set in New Detroit, where vampires have built up a Vegas-like capital for tourism and glamorized their nightlife, Straight Outta Fangton delivers a daring plan that unfolds into a complex plot that degrades into all-out war. The more Phipps work I read, the more I enjoy his fun style. The dialogue and characterization bring some lighthearted moments to an otherwise intense conflict. Peter is frustrated with the realities of his dead-end unlife, but begrudgingly still cares for his creator, Thoth. When he finds out a psychotic vampire hunter is in town, he goes to warn Thoth of the hunter's violent plans to attack the Old Ones. Naturally, there's a lot more history to it than Peter was aware of, and in playing his part to protect his way of life, he must confront his own personal history, from the people he loved to the terrors he took part in. The tension picks up considerably toward the end, and I enjoyed being fully immersed in this extravagant tale. I loved the variety and depth Phipps brought to the characters and the vampire culture in general. 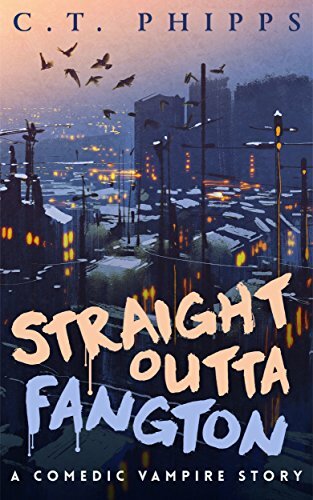 I highly recommend this book to readers looking for a smart urban fantasy with violence and action, and vampires that are decadent and bold without being romanticized.